Yesterday I received a slip from the U.S. Postal Service at my door. It indicated they had tried to deliver a registered package. I didn’t expect any registered mail, so I was curious. Odd. 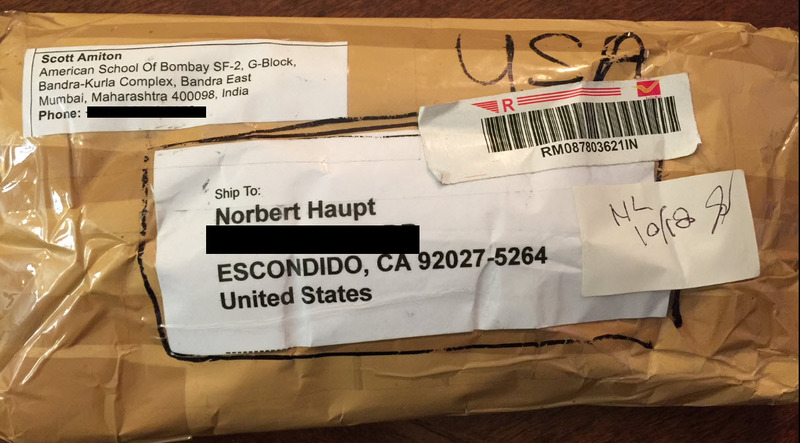 I didn’t order anything from Mumbai, India. I don’t know anyone at the American School Of Bombay. And especially not anything that would require registered mail. This didn’t help either. The description said it was a Vector. It was checked as a gift. And the postage to mail it was Rs 131. When I looked that up it was 131 Indian rupees. A rupee is about $0.015. So mailing the package cost him about $1.96. I didn’t want to open this. All I could think of was anthrax or a bomb or something else nefarious. I had just moved to this address. Who would even know what it was. And particularly Scott Amitron in Mumbai. I decided to let this sit there unopened until I figured it out. Sure enough, the last time I was on Amazon it showed me a razor handle. Like men are wont to do, I am stuck with the type of razor and blades that I used 30 years ago. I won’t upgrade to the fancy razors of today, with five blades and twenty-dollar handles. I just like my old Atra Plus double blades that have worked for me for decades, even though the blades are hard to find and my one remaining handle is getting pretty rusty and sketchy. So when I saw this replacement handle, I clicked on it and ordered it for $4.90, free shipping. 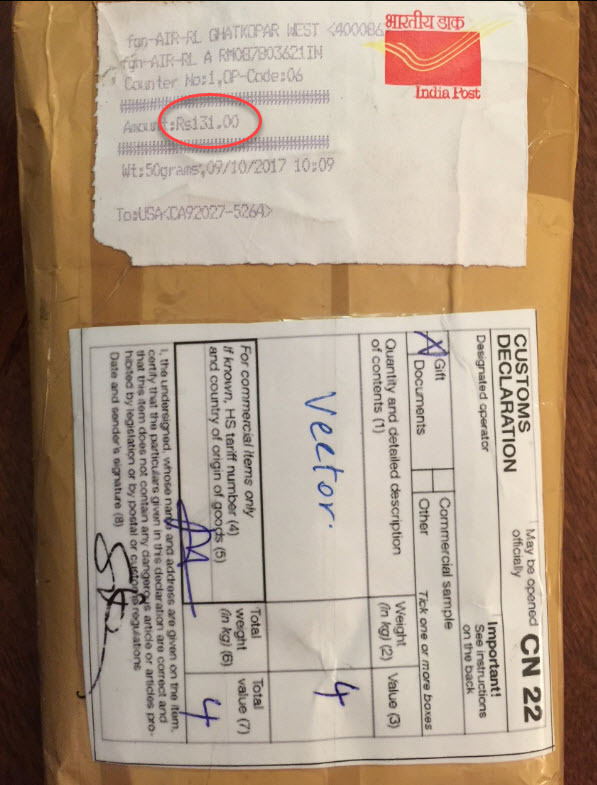 Not in my wildest dreams did I think that somebody in Mumbai in India would then fulfil my order and send me a razor blade using registered mail and pay 131 rupees, packaging and handling not included. I could have gone to the local drug store and bought a razor and spent a lot less time than I did waiting in line at the post office to sign for a registered package from India. Oh, the mysterious ways of Amazon and global commerce. I can’t wait to try my brand new Mumbai razor tomorrow morning. Can just imagine the fun you (and your neighborhood) would have had if you had reported it as possible anthax! – Good ending!